Samsung unveils its Samsung Smart Dock, which is a multiport docking station for your Samsung Galaxy Note II, including a full size HDMI output port, three full sized USB ports a microUSB (on the back, for charging purposes) and even a standard 3.5 mm audio jack output for you to use your favorite amplified speakers with it. Not all Kudos go for Samsung: The “Smart Dock for an Android phone” concept is not new: The Samsung Smart Dock seems to be a new concept rendition of an earlier (now defunct) product from Motorola, called WebTop. At the rather hefty price of U$S 99, the Samsung Smart Dock may anyway be of certain appeal for the -also fat wallet priced- Samsung Galaxy Note II owners. Interestingly enough, their current flagship product, the Samsung Galaxy SIII is not compatible with the Samsung Smart Dock. This single fact reminds me of the -by now oldie- Android fragmentation topic, on the hardware side. One would expect that the best exponents of Samsung Galaxy line would be compatible, expansion port wise, but such accessories-sharing capability seems not possible at this hardware-software integration level. Is the Samsung Smart Dock capable of converting your Galaxy Note II into an Android Desktop PC ? Certainly, it seems to be so, given the nice computing muscle specs of the Samsung Galaxy Note II processor, an Exynos 5 dual core Cortex A15. Such a workhorse carries more than enough processing power for any internet based work. 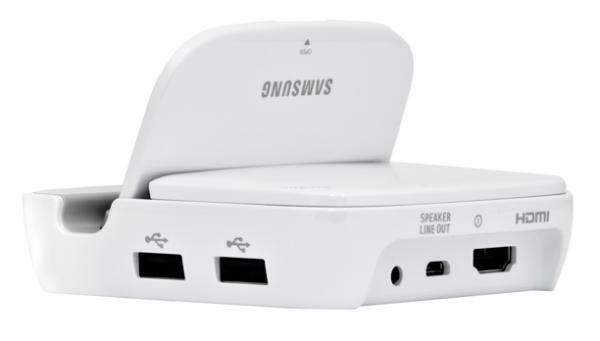 We can certainly envision the Samsnug Smart Dock being released as companion to other Samsung models in the future, but evidently on this down to earth bussiness world, such dream would require first plenty of embracing from current Samsung Galaxy Note II owners of this first Samsung Smart Dock.